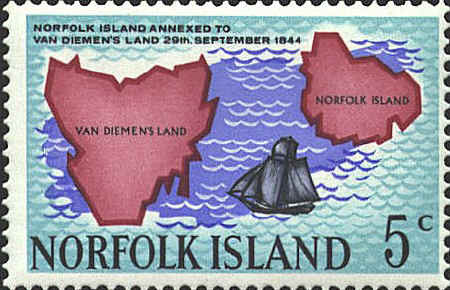 The two Norfolk Island stamps have the same design showing van Diemensland (Tasmania) and Norfolk Island. The islands are show as approximately the same size, and very close to each other. First, Norfolk Island is almost 1,500 miles (2,400 km) NNE of Tasmania, and second Tasmania is 68,401 km2 and Norfolk Island is 34.6 km2 both matters of scale.